This document deals with the purchase transaction where the seller gets mixture of cash and shares in the acquiring company. The transaction may be for any amount. The document includes a provision for an additional price to be paid if the profit warranted is met in current year. (Note: this is structured as an additional payment rather than retention out of the initial purchase price). The sale agreement also includes suitable warranties if there are leasehold, freehold or tenanted real property. 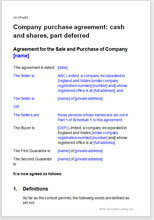 This agreement is for all shares in the company to be purchased, where part payment is in cash and part payment is in the shares of the acquirer. Optionally, there is provision for the final price to be increased if future profits exceed a short-term target. The industry, the size and the number of shares to be bought are not important to the suitability of use of the document. Usually, it would be the buyer who would draft the sale agreement, as he, she or it has the least information about the state of the business, and therefore the greater possible loss. However, this contract could be used by the seller, as an aide memoire for negotiations or to help create heads of terms. The bulk of the document comprises the warranties. The seller warrants that there is no undisclosed information that if known might reduce the value (for example, that there are no materially large contingent liabilities in supplier contracts). If the warranty turns out to be false, the buyer has recourse to seek damages. We provide many warranties in the document. You can choose which are appropriate for your circumstances and delete those you do not need. We find that it is easier to provide a large list to be edited by deletion than a short list and expect the client to add more. We also include an example disclosure letter to be used. It is unlikely to be perfect as is – we expect you to edit it. However, it will provide you with a format that shows how such a letter works, and a style you could use. Your words can be added easily. This document complies with the Companies Act 1993 as amended. If your deal is for some, but not all shares, then a shares purchase contract should be used in place of this one. Since the deal is partly for the equity in the buyer’s company, the seller may be subject to provisions in any shareholders’ agreement as soon as the transaction is completed. The seller should therefore enter into a new shareholders’ agreement at the same time as the deal for the acquisition completes.